And welcome back to the What the Heck Do I Do With All These Purple Sweet Potatoes series. Before succeeding with the pie, I baked a delicious but oddly-colored cake, and was determined to make something that used baking powder but stayed purple. Still nicely purple inside, but they basically didn’t rise at all. Here’s a nice explanation of the best method for making muffins. I’m pretty sure I didn’t commit the sin of over-mixing, but I probably didn’t let the batter sit long enough before putting it in the oven. Or possibly the fault lay in the ingredients, which I list below. The recipe is based on an old one for Louisiana Yam Muffins (let me say again: just about anything you see labeled as a yam in the US is a sweet potato), but I altered it considerably to suit my purposes. Makes 18 muffins. 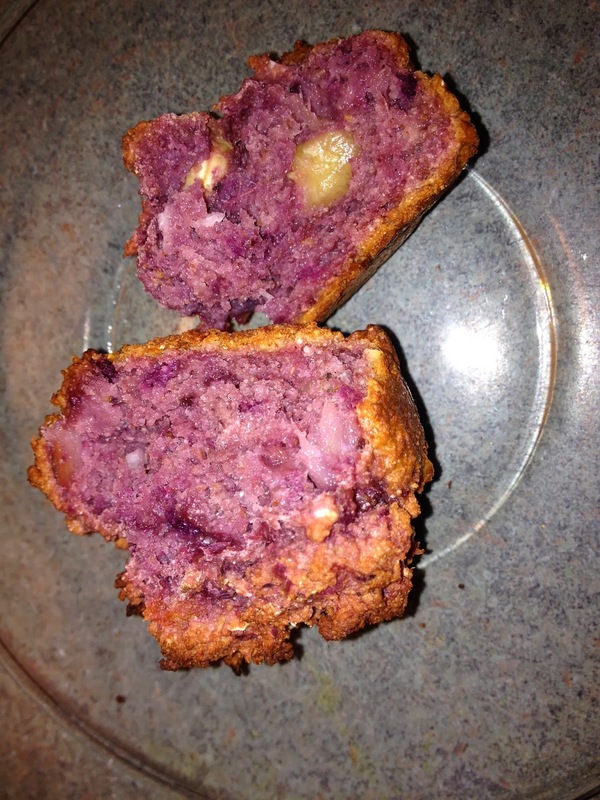 So, why did my muffins stay purple while my cake turned green, and why didn’t the muffins rise properly? You’ll recall that the anthocyanin pigments in purple sweet potatoes react with alkaline ingredients (like baking powder) and turn green, so I tried to compensate by adding some acidic ingredients (yogurt and pineapple). I was guessing as to necessary amounts, but it seems to have worked. As far as the flatness goes: problems with the method as indicated above; heavier flours (I wanted to give the coconut flour a try, but it does tend to thicken batter); too much acid for the baking powder to work well (I might have added some baking soda, which is more strongly alkaline, except I bet that would have shifted the color into the yuck range); or just the sweet potatoes themselves being so heavy. They were leftovers from the previous night’s dinner, already mashed with a little salt and pepper and broth added, but I don’t think those ingredients affected the rise, or lack of. The sweet potatoes are just very, very dense-fleshed, and frankly kind of gluey at times. 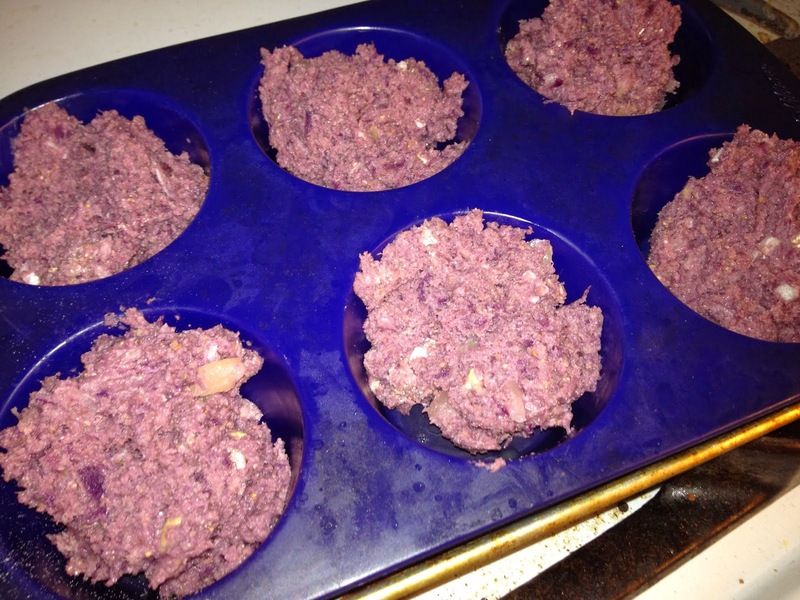 It’s possible that pureeing them in the food processor, as I did to make the pie, would have added a little lightness. The only thing I can say is to make sure your baking powder is fresh! I always store mine in the freezer to keep mine fresh. Don't use baking powder that's over a year old as well (write the date on the container). I'm fairly sure mine was fresh, but I will keep that hint in mind, because sometimes it does sit around for a while. Thanks!